Based in Halifax, Nova Scotia, Mocean Dance creates and performs athletic, vibrant contemporary dance. Led by Co-Artistic Directors Susanne Chui and Sara Coffin, this versatile creation company commissions Canadian choreographers and company members to create dance that is highly physical, collaborative, and technically and emotionally rich. Mocean Dance tours internationally, delivering performances that engage audiences, and offering outreach activity to support the growth of contemporary dance in Canada. 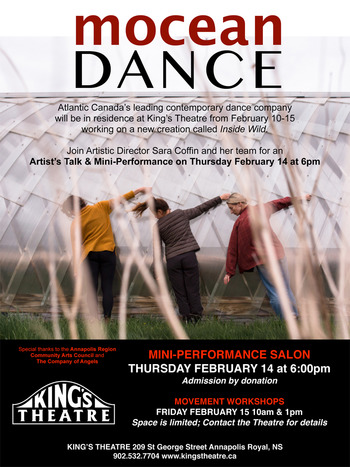 On Friday Feb 15 at 1pm-3pm, they will be offering a Wild Inside Movement workshop for Adults. It will start at ARTsPLACE (upstairs) and move down the street to the Theatre for some work on-stage. No experience is necessary! But space for each is limited to 30 people, so you need to sign up at the Theatre.